A group of guys gets together here in Bentonville once a week to play Dodgeball. They usually meet on Monday or Tuesday night, which are always Arkadelphia nights for me. But, this last week before I have to go back, they played, and I got to go. My friend Gary Withrow puts it all together, and does a fantastic job at it, too. I got to know Gary through our church's Studio 412 youth ministry last summer. Gary is a wonderful guy, with a servants heart for the LORD. Before he was my worst nightmare on the Dodegball court, he was a photog friend, who always had the gear I needed, and always magically didn't need it when I did. All the times that I've been, he's managed to get 30-40 boys together, which is absolutely incredible. He manages to get a weekly game together, and maintain that high attendance on a week-to-week basis. He also manages the group website, updating it constantly with game meet-up times. Now, I'm not too hot at Dodgeball. I'm actually one of the oldest boys there, besides the grown men. I can hold my own pretty well, and I try not to do anything foolish, but I'd definitely rank myself towards the bottom of the batting order. 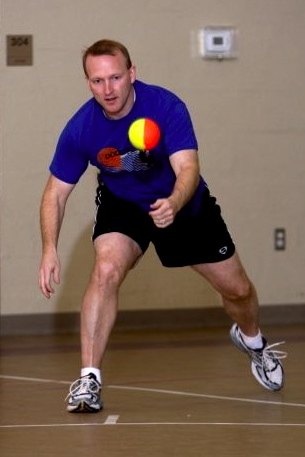 Gary calls it FBC Dodgeball, but it is not run by a church staff member, he does it. Tonight, we started playing at 6pm. At 7pm, we all meet at half court for a healthy 20min devotion from Gary. He does a fantastic job at putting out relevant, interesting material for us boys, I don't know how he keeps coming up with this stuff. After that, it's another 40mins of dodging airborne orbs, and we're done. It's really a healthy weekly physical activity that's simple, fun for 14 and 34 year-olds, and spiritual. I love the fellowship with the guys, and the challenge the talk places on my heart every time. If you reside in the four-seven-nine, check out the group's website at fbcDodgeball.com.